This is the first cake I ever learned to bake. It has a rich banana flavour, and is a firm favourite in our household. The recipe came from my Nana’s neighbour, Mrs Mac, who showed me how to make this in her kitchen and then let me proudly take the results home with me. I honestly don’t know what the ‘Mac’ was short for, but her first name was Norma. She had wanted children but they hadn’t been able to have any of their own, and she doted on us when we came to visit my Nana and Pa.
Mrs Mac had been a cook in the army, which was how she’d met her husband, known by all and sundry as ‘Mac’. Mr Mac, (we could never quite bring ourselves to call a grown-up by their first name), an English Merchant Marine working with the Australian Navy, was taken prisoner by the Japanese when his ship was sunk in Singapore in World War Two. He ended up as a prisoner-of-war in Changi Prison. When he finally came home to Australia he weighed so little that Mrs Mac could pick him up under one arm, so she told us. He’d lost most of his teeth and was very ill for many years, so she used to make this banana cake a lot because it was moist and easy to eat, and one of the few things he would actually ask for. Mr Mac remained whippet thin; a stooped grey-haired old man by the time I knew him, who chain smoked endlessly, raced pigeons and would let me see his many tattoos, done during his time in Changi. My favourite was a hula lady on his arm – he could make her hips wiggle by squeezing his bicep. I still call this cake Mrs Mac’s Banana Cake. The secret ingredient in this cake is love, so don’t forget to add some of your own! 4 ounces of butter (1 stick or 115 grams), 3/4 cup of caster sugar (superfine sugar), 2 eggs, 3 very ripe bananas, 1 teaspoon of vanilla extract, 3/4 cup self raising flour ( or 3/4 cup all purpose flour with 1 heaped teaspoon baking powder), 3/4 cup plain flour (all purpose flour), 1 teaspoon bicarbonate of soda (baking soda). Preheat your oven to 180C (moderate or 355F), and line a loaf tin with non-stick paper, or grease and flour it well. Cream the butter and sugar together. (Mrs Mac used arm power, I use an electric beater!) The butter and sugar mixture should be pale and light. Add the eggs one at a time, beating well after each addition. Mash the peeled bananas in a bowl with the vanilla. Dump this into the butter mixture and use the beaters to combine well. 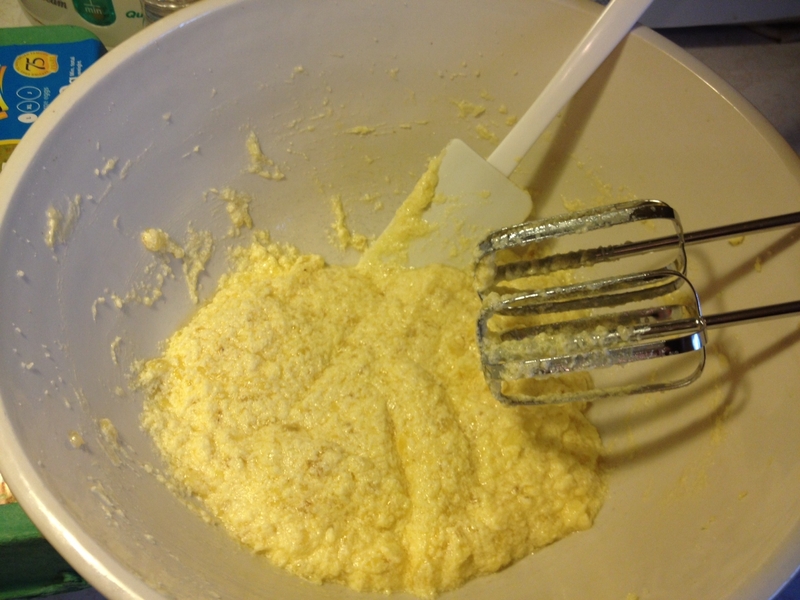 The mixture may look as if it is curdling or separating – don’t panic! It will still be fine. The butter and banana mixture may look like it is separating, but that's okay. It will all come together when you add the flour! Sift the flours and bicarbonate of soda into the bowl with the banana and butter mixture and use a spoon to gently combine. Do not beat, just fold through. Bake for 45 minutes, or until the top springs back lightly when pressed. This cake is delicious on its own, or you can brush the top of the hot cake with a little butter and sprinkle some cinnamon and sugar over it. If you want to be fancy the banana cake can also be iced. Beat 4 ounces of butter (1 stick or 115 grams) until soft and creamy. Gradually add 1 and a half cups of icing sugar (confectioners or powdered sugar), adding a tablespoon or so of milk to get a smooth consistency. Spread over cake. Add a teaspoon of coffee, or a dash of maple syrup (both together are sensational). Lemon juice instead of milk gives a zesty tang. A teaspoon or so of cocoa powder is also heavenly. This entry was posted in Cakes and desserts and tagged Army cooks, baking, banana cake, banana cake recipe, banana recipe, butter icing recipe, Changi Prison, cooking, easy banana cake, love, moist cake recipe, POWs, prisoners of war, recipe heritage, World War Two by Cauldrons and Cupcakes. Bookmark the permalink. I’ll have to go back and update my other recipes so you can try those too! 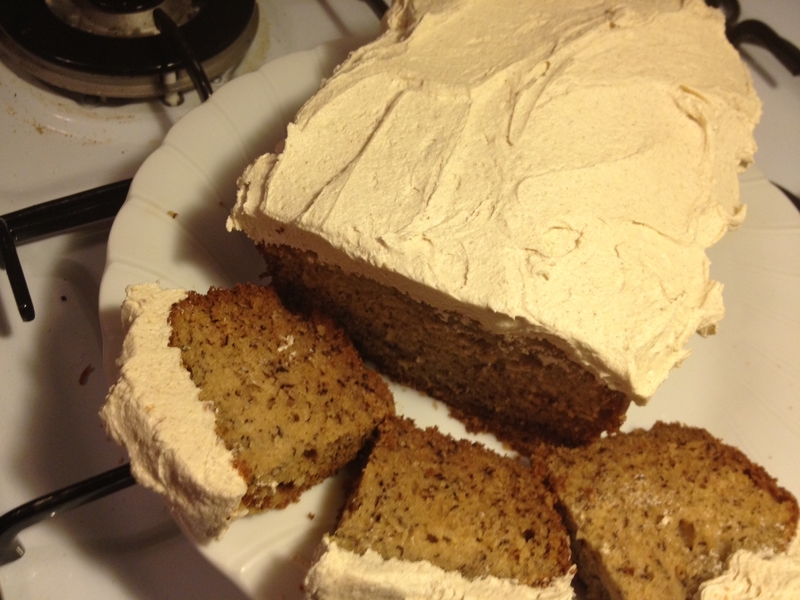 Banana cake – oh my – it’s the best! Thank you for jogging my memory to this treat! I have several bananas languishing in the ‘fridge! And maple?? Yes. Haha, you take good care of me :-)! i love your recipes, nic! they are the only ones i can follow. i’m still making your lemonade scones regularly. fascinating story! The info on the prison camp was very interesting. How those men survived I’ll never understand. I don’t really understand either, and for so many their suffering didn’t end with freedom. Mr Mac never was well enough to work again, and reflecting now, as an adult, I realise how deeply he suffered from PTSD, depression and survivor guilt. And his good wife stuck by him through it all, loving him, caring for him, worrying about him until the end. As a child I used to think he was just a gruff old man, and I couldn’t understand how someone as sweet as Norma would be married to him, but she would sometimes show me the pictures of him before they married, and before his capture, and he was a handsome, cheeky young man with a broad smile, sparks in his eyes and a deep love of life. She still saw that in him, and her love was big enough for them both. I’m still awed by her life of sacrifice, but that’s what love is, and I know he loved her too. 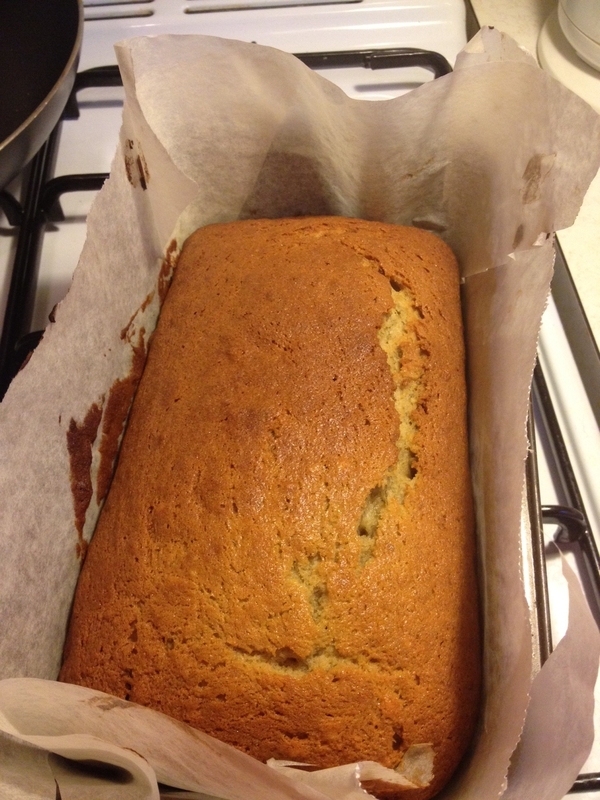 Am going to make this Nic, my kids love banana cake and I’ve only used packet mix in the past. That looks so good! Bananas in baked goods are some of my favorite things. That reminds me that I have a banana, chocolate chip, walnut cookie recipe floating around . . . In any case, thanks for the US equivalents! You know us: can’t weigh, must scoop and guesstimate! One of my favorites ~~ wish I could reach through to the image and grab a slice! YUMMM!! This is a great post, a recipe with a tale. Your cake looks delicious, I can just imagine plunging in when it’s straight out of the oven and enjoying it with a lovely cup of tea. hmmm….I arrived at your blog through “I stop through suffering’s” link to the chakra post and photos, (wow…some of those really resonated!) 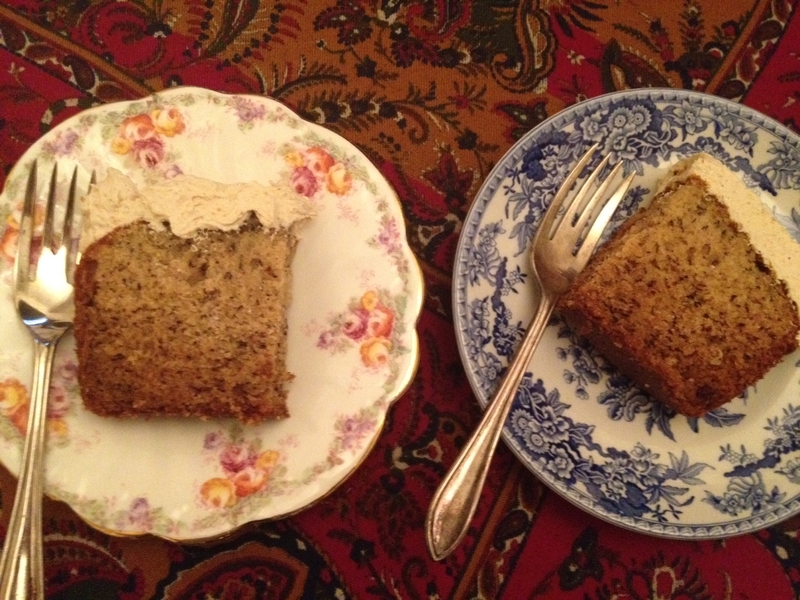 wandered on to the mindfulness ideas….really helpful, thank you….and then noticed the banana bread story, photos and recipe… kind of interesting to see those 3 particular posts…..and how they tied together in this banana bread post in one of my posts…. : ) …. http://reflectionsfromafriend.wordpress.com/2011/10/28/1028-what-we-do-in-this-present-moment-has-the-ability-to-influence-the-future/ (that friend who wrote that about cause/effect and impermanence had previously made and shared his banana bread/cake with me …yummy….) That frosting on the banana bread sounds delicious! I had been looking for a recipe for my son’s first birthday, and I think I just found it! I can’t wait to try it out! Made this for my baby’s birthday today, with cocoa icing, and it was terrific! Made it as cupcakes, and the babies loved them! Thanks for including American measurements — it made my life a lot easier, not having to look up equivalents. We Americans really are pretty hopelessly backward in some ways. Anyway, great recipe! Thanks! I enjoyed this cake. I added an extra tsp of vanilla, half tsp of pear essence, 1 tsp cinnamon, 1 2tbs raisins and 2 tbs dried cranberries. i can only remember the story of him eating rice with his back to the wall. I know. Breaks your heart, doesn’t it? I am making this tomorrow for hubby’s dessert. Have everything on hand. I love your dessert banner picture at the top. It was on a cover of a cookbook from a grocery store (Shop Rite) that I would get each week when my mom did her shopping. I had them until they all fell apart on me. But they helped me become the baker and cook that I am today. Thanks for the memory..